Washington State guard Derrick Low, an Iolani product, scored 21 points in the second round of the NCAA Tournament yesterday. SACRAMENTO, Calif. » He wasn't nervous or scared, even though everyone else in ARCO Arena was afraid to breathe, let alone watch the game without crossing their fingers. But Derrick Low looked as calm as a guy taking the ball out to the park for a game of H-O-R-S-E.
NCAA Tournament? Nah, just another game. 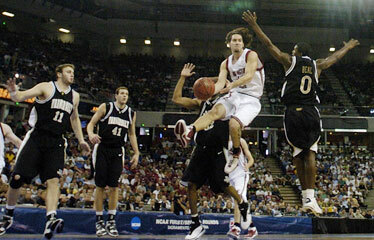 The former Iolani School star lives for these moments and he delivered just about every time Washington State called his number yesterday afternoon in a second- round NCAA Tournament game against Vanderbilt. It's just too bad Washington State coach Tony Bennett didn't call Low's number a few more times at the end of the game. "He really did have it going," Bennett said of Low, who finished with a team-high 21 points. "Maybe we could've looked for him a little more because he was making the big shots for us." Unfortunately, Low never touched the ball on the decisive possession in third-seeded Washington State's 78-74 double-overtime loss to sixth-seeded Vanderbilt in front of 16,407 at ARCO Arena. Instead, Taylor Rochestie took Washington State's last shot, a 3-pointer from the top of the key, and was long off the rim. Vanderbilt scooped up the rebound and took it in for a layup to extend the lead to four points and effectively end the game. So instead of Low and the Cougars (26-8) moving on to continue their improbable turn-around season, it will be Vanderbilt (22-11) in the Sweet 16 next week. "I had a really good experience and opportunity to play in the NCAA Tournament," said Low, who won three straight state titles at Iolani. "We got to the second round. I don't think anyone from Hawaii has done that. So I'm really grateful for that. "It was a great experience and hopefully we'll come back next year and do something bigger. I like to think this is just lighting the match." Low was the leading scorer (13.6 ppg) and 3-point shooter (70) for a Washington State team that hadn't had a winning season in 10 years. Thursday, he helped lead the Cougars to their first NCAA Tournament win since 1983. His solid play this year earned him first-team All-Pac-10 Conference honors and vaulted him onto the national radar as a future NBA prospect. Derek Byars, Vanderbilt's star guard, who was the Southeastern Conference Player of the Year, had nothing but praise for Low after yesterday's game. "Big-time players make big plays for their team. I'm glad I was able to and he was able to. I feel bad somebody had to lose that game," said Byars, who scored a game-high 27 points. "Derrick is a great player. He's a great shooter. He's a lot quicker than I thought he'd be, too." In some ways, Low was a victim of his own success. He made two huge shots in the first overtime, the last a 3-pointer with just 40 seconds left that tied the game at 69-69 and sent it into double-overtime. So after that, Vanderbilt paid extra attention to him on defense and he only got off one shot in the second overtime period. "They were switching players onto me, so I just tried to keep moving and get open," Low said. "Sometimes I got open, sometimes I didn't. "I wasn't nervous though. The worst thing you can do is miss, right? So you just have to keep taking them. That's what my team needs me to do." That's what his team wanted him to do, too. Washington State just couldn't get the ball in his hands at the end of the game. "Derrick wanted the ball at the end of the game," Washington State forward Aron Baynes said. "Everyone had confidence in him to knock those shots down and he made a lot of big plays. It was right there for us, but we just weren't able to grab it in the end." Despite the loss, this will go down as an historic season for Washington State. No one expected much from the Cougars, because, well .... no one ever expects much from the Cougars. But Washington State surprised everyone with 26 wins, which tied the school record from the 1940-41 season. It also earned its first national ranking since 1983. The Cougars made headlines all over the country, with the likes of USA Today, CBS and the New York Times falling for the lovable Cinderella team. Because of his play and endearing personality, Low became one of the team's most famous players. All the attention wasn't so good for his cell-phone bill though. As of Friday, his voicemail was full from well-wishers back home in Hawaii and friends from school. Because of the team's tight schedule, he wasn't able to return many of the calls. "I represent Washington State, but I'm from Hawaii too, and that's something I hold deep to my heart," he said. "I know my family and friends from home are watching me and backing me up. It's just a good feeling to have something like that." Low was disappointed after the loss, but was still able to put it all into perspective. "This is big-time — the NCAA Tournament is as big as it gets," he said. "It meant a lot. Washington State has been pretty much the doormat of the Pac-10 for the longest time. We had some hard times the first two years, but the main thing is that we got here and we're just going to keep building on this. Eventually we'll turn this program all the way around."